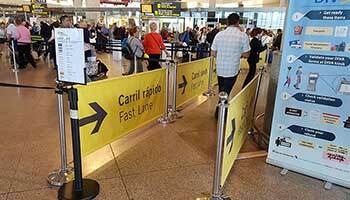 The fast track service is available to all passengers at Malaga Airport. You can purchase a ticket online here. Fast Track is also available for passengers flying with the airlines listed below and who are Business Class card holder. Make sure you clearly state that you’re booked through Fast Track when you check in, since the Boarding Pass must have the correct stamp for you to be admitted to the fast lane through security checkpoints. Click here for more information about VIP Lounge and services. If you require plastic luggage wrapping, there are three facilities in the T3 Check-In Area where you can get this done. Instructions on how to recover your lost objects at the airport can be found here. Any lost luggage on your flight you will need to contact your airline details here. If you are travelling with hand luggage only, please note that the maximum dimensions for a carry-on bag are 9 inches x 14 inches x 22 inches (22 cm x 35 cm x 56 cm), including handles and wheels. Items that are not allowed in hand luggage apart from the obvious like firearms, knives or anything else that could be regarded as a weapon can be found here. If you need to take medication on your journey, make sure you have the necessary dosage for the duration of your journey and stay, along with a prescription as proof. If you need to carry medical utensils such as (syringes for diabetics, measurement apparatus, etc. ), you must inform your airline beforehand, and they will let you know what procedure to follow. If the medical equipment is classed as a prohibited hand luggage item (needles, for instance) it will be permitted as long as its necessity of use is suitably verified at the security checkpoint. There are restrictions on quantity of liquids in hand luggage – click here for more information. If you need a bag for liquids before travelling, they can be purchased here at the airport. Pregnant Women: While women up to 28 weeks pregnant can travel freely, it is recommended that women more than 28 weeks pregnant only travel with medical authorisation. Women who are more than 36 weeks pregnant are advised not to fly. Travelling with Babies: Inform your airline when booking flights if you are travelling with a baby; you may need to book a special seat. You will be allowed to take 2 items of hand luggage including one containing your baby equipment and any liquids for use during the journey, such as baby milk and food. Unaccompanied Minors: Children aged 5 to 12 years travelling without a parent or guardian are allowed with certain conditions – click here for more information. As always, it is advisable to check with the airline when booking the flight. Reduced Mobility: Click here for more information about disabled facilities at Malaga Airport. Medical Centre: If you require medical assistance, the Medical Centre is located at T3, Floor 0, as shown on the map. There is a pharmacy located at T3, Floor 1 Departures. Malaga Airport has 12 cardiac rescue points with defibrillators. There a few ATM machines and currency exchanges located around the airport, which accept Mastercard, Cirrus, Maestro, EC, Union Pay, American Express, JCB, Visa, Visa Electron and Plus. Currency Exchange Points can be found at T2, T3 Boarding Area and T3 Arrivals Hall. 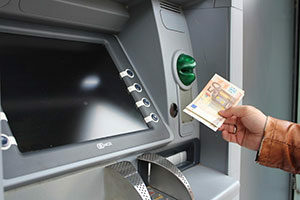 ATM machines are supplied by Euronet, Unicaja and Banca March. Banca March ATMs are located at T3, Floor 0 Arrivals Hall, Floor 1 Check-In Area and T3 Parking (P1) Zone Billing. If you are flying from the UK to Malaga Airport with your pet, you will need a pet passport from your vet. Certain airlines and airports in the UK will allow you to take pets but none allow them in the cabin. Instead, and unlike other European airlines and airports, your pet will have to go into the baggage hold. Click on the UK Government website here to find out which airlines and UK airports transport pets. If you are travelling with a guide dog or an assistance dog, it might be able to board with the passenger without any additional charge. Your pet must be properly equipped with muzzle, collar and lead. You will also need an official hardcopy certificate qualifying your pet by Assistance Dogs International (ADI) or the International Guide Dog Federation (IGDF). If the dog is going to travel in the cabin, it will be placed next to the passenger in a place indicated by the crew. In this event, we recommend that you notify the airline a minimum of 48 hours in advance. Please also check that you have all the correct vaccinations, microchip and necessary paperwork from your airline before you travel.